.:Soul:. Wild Ride! | .:Soul:. To your left, we have the new Wild Tattoos! Meant to be subtle, these striking tattoos come in two species, three intensities, and are available in two colors, black or white, and include both Tattoo Layers and Omega Appliers. 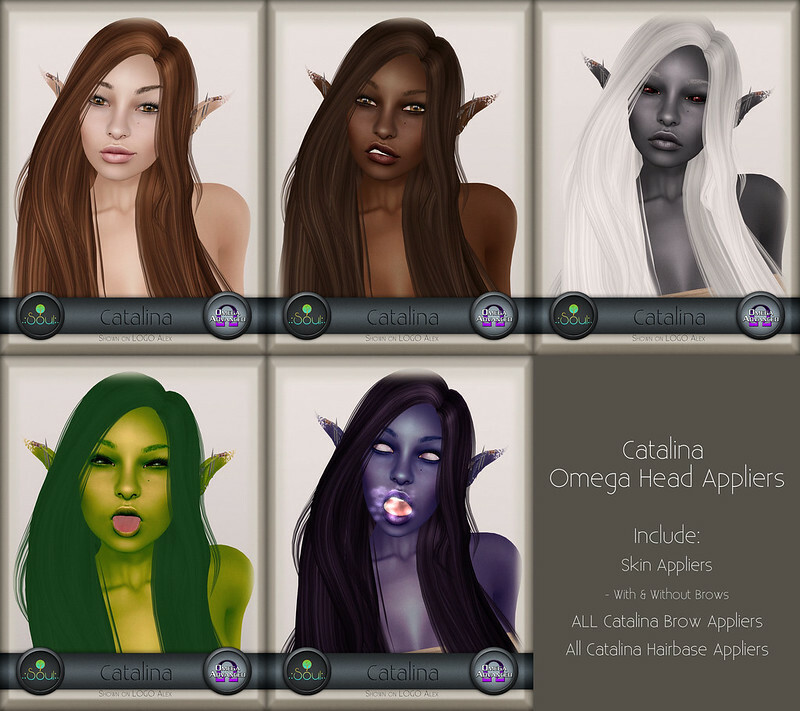 Also to your left, you will be able to see the, up till now, shy Catalina and Davina Omega Head Appliers! These shy creatures have finally come out of hiding thanks to your gentle prodding! Included with each applier are appliers for the Catalina Hairbase in every color made, and the matching brows for the skin. Around the corner to your Left, we come to the Big Cowl Tunic Update! I was just recently approved to make Slink Mesh Fitted clothing, so to practice, I have updated the Cowl Tunics with Slink Physique, Hourglass, and Men’s Physique! If you already own one or more of these, expect an update to be sent to you shortly! If you don’t receive one, stop by the store and slap that redelivery terminal! Now we come to the end of the notice. I hope you enjoyed your visit! This entry was posted in Appliers, Body parts, Clothing, Female, Head Appliers, Makeup & Tattoos, Male, New Releases, Skins, Unisex, Updates and tagged Applier, Catalina, Catwa, Cowl Tunic, Davina, Hourglass, omega, physique, skin, SLINK, Slink Male, Tattoo, update. Bookmark the permalink. ← .:Soul:. Retirement Sale & Dominic Omega & Genesis!